I’ve been a bit obsessed with purple cauliflower recently. 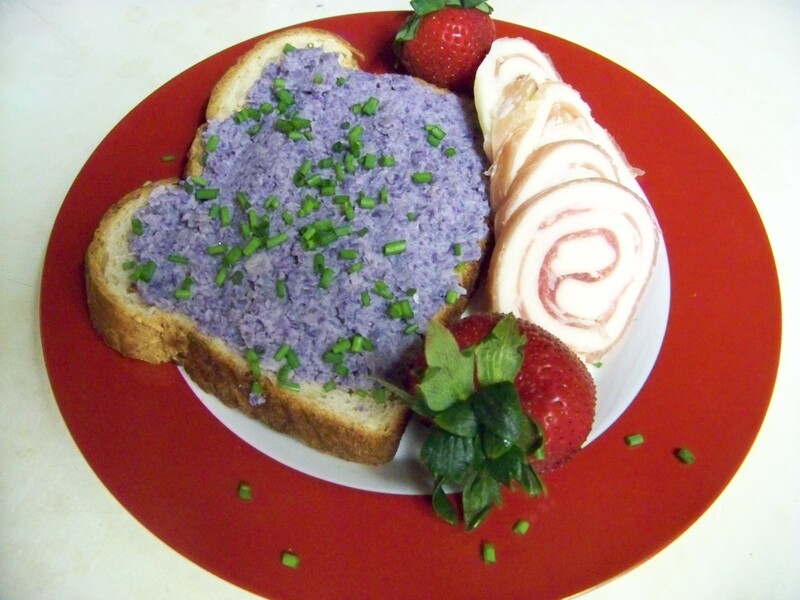 Did you know that there aren’t many recipes for purple cauliflower? 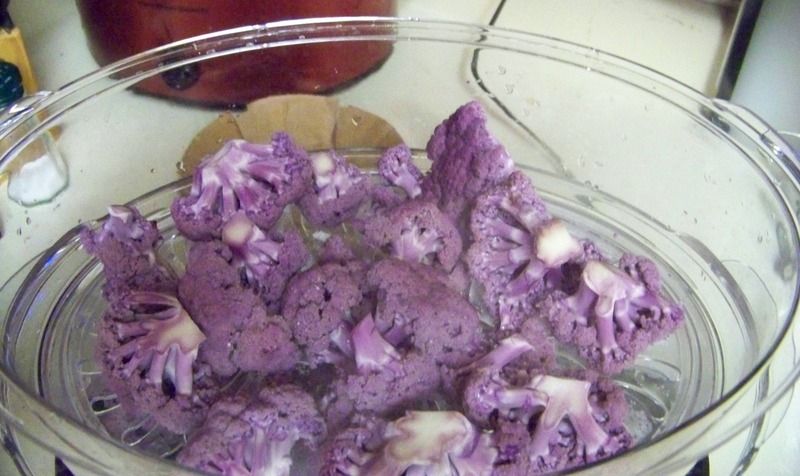 Oh, you can find oodles and oodles of stuff to do with cauliflower, but not much that can take advantage of the gorgeousness that is purple cauliflower. I did find this beautiful recipe and I wanted to try it out, so today I went to work. Purpleness in a a very affordable Hamilton Beach Steamer. While the cauliflower steamed, I drained a can of Joan of Arc butter beans. 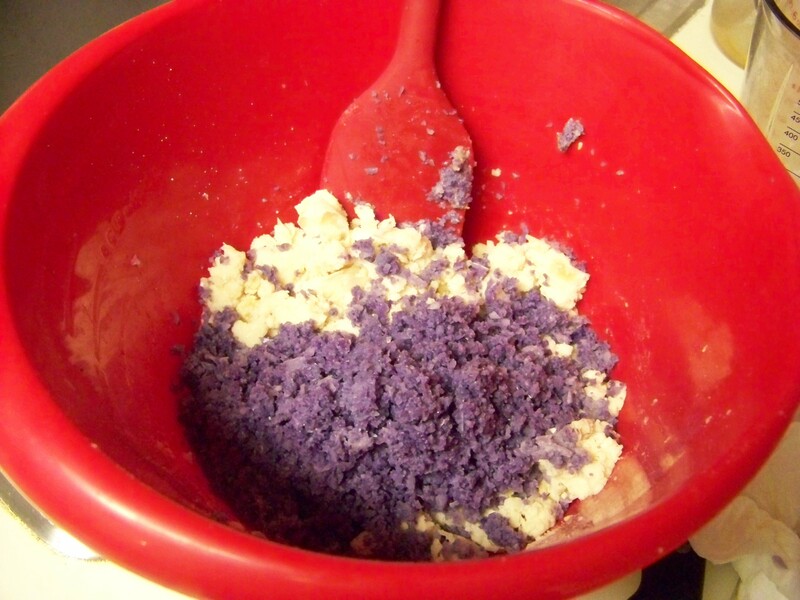 They were, um, very firm, which meant they kind of ground into a chunky, powderyness in the food processor. Next time I might just cook up some lima beans until they’re mush. I love lima beans, and they can get very mushy, which I think will serve this dish better. When the cauliflower finished, I let is cool for a a minute, and I do mean a minute. I was in a hurry to try this out. I’d been searching for tahini, which is not an ingredient I normally keep on hand, for a week. Finally found it at Kroger for, like, $10 bucks in the organic section. I plan to get some mileage out of it at that price! So after it briefly cooled, I processed it in batches in the food processor. Took maybe five batches for the whole head. I do so need to get that super-large processor! Mashed beans and riced cauliflower meeting in a bowl! Next I added about a tablespoon of olive oil, and two tablespoons of tahini. That’s more than the original recipe called for, and I admit, it was a bit of tahini overkill. I can still taste it hours later. I really don’t care because a) tahini is awesome! and b) the recipe needed more of a binding liquid as I made it. I eventually added about a tsp of water just to help it gel. I also added some sea salt and black pepper. Dinner of the puree on toast with a scattering of chives, some Boar’s Head Prosciutto panino, and some fresh organic strawberries. YUM! I’m not going to post the recipe yet, because I intend to mess around with it until I get it perfect. In the meantime, you can check out the link at the top of this post and try it for yourself.